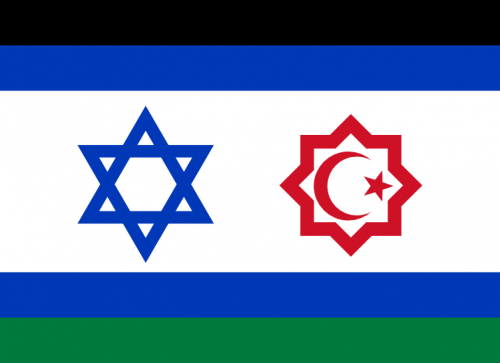 Have you even wondered what a united Middle East would look like? An end to settlements and refugee camps. An end to mortar attacks and border crossings. An end to politicians pandering to the military industrial complex. 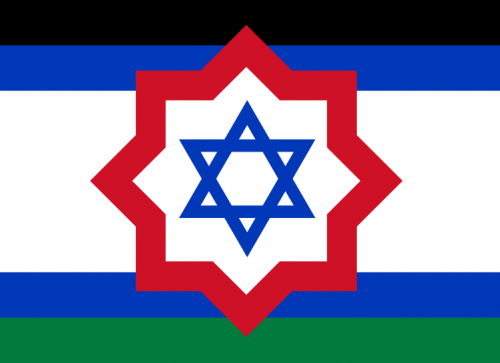 What would a flag look like for a Israel-Palestine state? 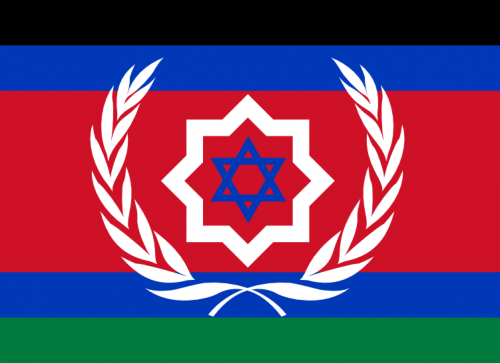 This flag uses the design of the flag of Israel and it adds the colors of the flag of Palestine. 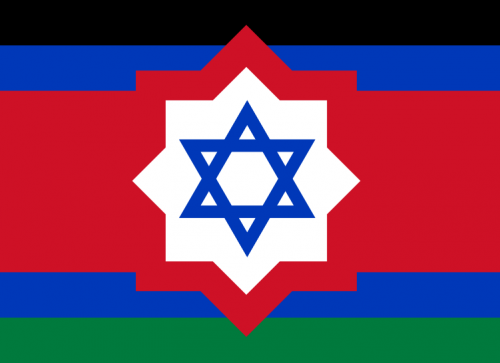 In addition, a red eight-sided star known as Rub el Hizb is added next to the Star of David. The eight-sided star has been used Islamic culture and it has been associated with Jerusalem. 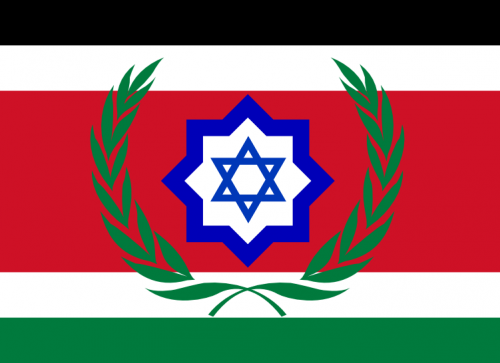 This variation for a combined flag uses the Star and Crescent to to represent the Palestinian people, most of which are Muslim. 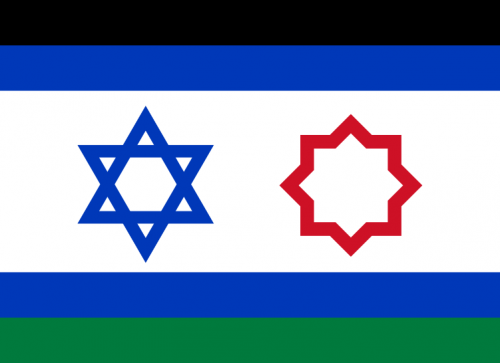 The star and crescent is a universal symbol used by many cultures but in the 20th century it was widely adopted in a symbol in the national flags in the Middle East. 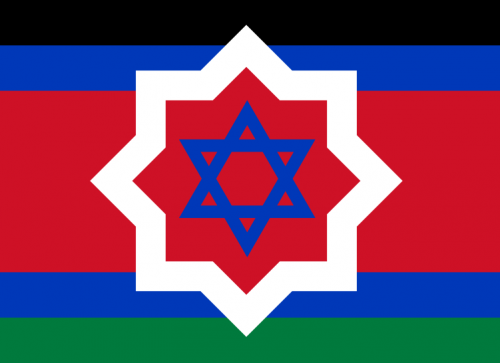 To better represent the idea that the two peoples of Israel and Palestine have a lot more in common than their perspective governments would like to admit, the following variation on the design aligns and embedded the stars together. The olive branch is an international symbol of peace so the following design incorporates two olive branches. There has been some analysis on court documents from the ongoing Apple v. Samsung lawsuit that has been revealing in how Samsung operates. It has been revealed that Google, the maker of the Android Operating System, informed Samsung that the Galaxy Tab and Galaxy Tab 10.1 android tablets looked “too similar” to Apple’s iPad tablet. Court documents reveal that Google demand a “distinguishable design.” A Samsung sponsored study also found that Samsung’s physical design and even software icons where too similar to the iPhone’s and that Samsung required to innovate further.